alaTest has collected and analyzed 9987 reviews of Microsoft Surface Pro 3 (Windows 8.1 Pro, 2014). The average rating for this product is 4.4/5, compared to an average rating of 4.5/5 for other products in the same category for all reviews. Reviewers really like the size and screen. The portability and performance are also appreciated. Opinions are divided on the price. Many are less positive about the GPS navigation and connectivity. We analyzed user and expert ratings, product age and more factors. Compared to other products in the same category the Microsoft Surface Pro 3 (Windows 8.1 Pro, 2014) is awarded an overall alaScore™ of 93/100 = Excellent quality. The Surface Pro 3 is Microsoft's biggest and best tablet yet, but it needs a better keyboard to truly replace your laptop. Microsoft's Surface Pro 3 wants to be everything to everyone, but it's not there yet. It sacrifices tablet features to be a good laptop, and laptop features to be a good tablet, but ends up somewhat disappointing on both ends. A number of small changes make a world of difference. In all, Microsoft has made the choice between a traditional notebook and a Windows tablet far more difficult. Microsoft's Surface lineup just keeps getting better and better, with an improved screen for desktop use and an upgraded Type Cover for the road. 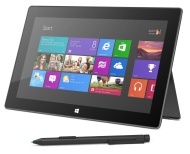 The Surface Pro 3 reviewed here is a 2014 product. It was replaced by 2015's Surface Pro 4 , which remains the company's top-end tablet. While the new Surface Pro 3 is Microsoft's best PC to date, it's more successful as a tablet than a laptop replacement. Keyboard not included; Runs a bit hot; Below average battery life ; The Microsoft Surface Pro 3 tablet has a larger and sharper screen, more versatile kickstand and better pen integration, but it's a pricey laptop replacement. The Microsoft Surface Pro 3 tablet has a larger and sharper screen, more versatile kickstand and better pen integration, but it's a pricey laptop replacement. There's a lot more work to do on Surface Pro 3, including substantial battery life testing and continued usage. If there's anything in particular you guys want to see us touch on, leave it in the comments below.